Reliance Jio has a knack for offering its customers with disruptive plans, the telco has now brought a new offer on its JioFi 4G router. 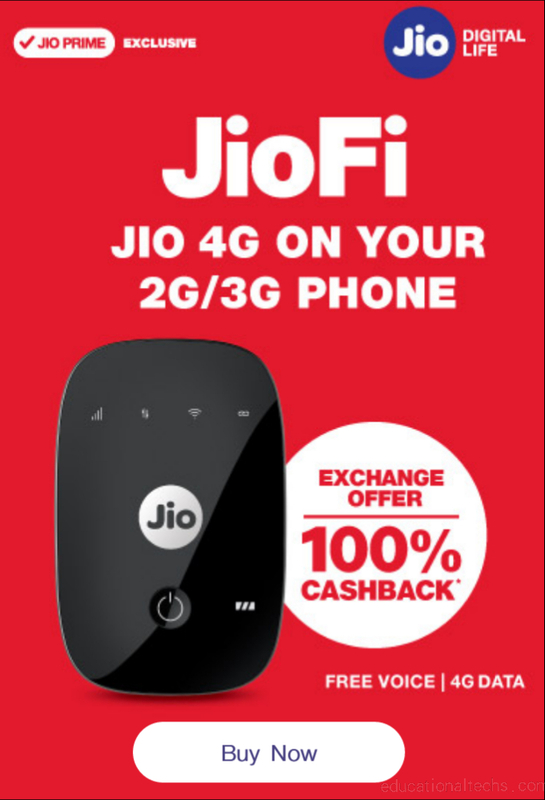 According to reports, consumers will get up to 100 per cent cashback on purchase of JioFi 4G router in exchange for old data card, dongle or a hotspot router. According to 100% cashback offer is listed on the Jio website under the devices segment. JioFi device is a hotspot device, which lets users rely on a Jio SIM to set up a WiFi hotspot and power other devices. Step 1: To avail of 100 per cent cashback, you need to purchase JioFi device through Jio online portal by paying Rs 1,999. Step 3: You need to purchase a Reliance Jio SIM card, which can be done at a Jio Store or any other partner store by furnishing identity proof, address proof and passport size photograph or Aadhaar card. Step 4: You need to recharge with Rs 408 (309 + 99) or Rs 608 (509 + 99) plan and enjoy the benefits of a Jio Prime membership, along with Jio Dhan Dhana Dhan offer. Step 6: After the expiry of the Jio Dhan Dhana Dhan offer period, if you availed of the Dongle exchange offer, you get free 4G Data worth up to Rs. 2010/- (10 vouchers worth Rs 201/- each). You will be entitled to 5GB of 4G data worth Rs 201 top-up with each recharge (up to 10 recharges) done before 31 March 2018. Step 7: After expiry of the Jio Dhan Dhana Dhan offer period, if you did not opt for the Dongle exchange offer, you get free 4G Data worth up to Rs 1005/- (5 vouchers worth Rs 201/- top-up). Customers will be entitled to 5GB of 4G data worth Rs 201 top-up with each recharge (up to 5 recharges) done before 31 March 2018.